STUNNING DESIGNO WHITE WITH FULL BLACK ARTICO LEATHER UPHOLSTERY. ONLY ONE OWNER FROM NEW, VERY LOW MILEAGE. MERCEDES WARRANTY TILL 25th APRIL 2020. PREMIUM PLUS PACKAGE. GARMIN MAP PILOT SATELLITE NAVIGATION. FULL ELECTRIC FRONT SEATS. MERCEDES ME CONNECT. 18" AMG ALLOY WHEELS. AIR CONDITIONING. CRUISE CONTROL. MULTI FUNCTION STEERING WHEEL. ELECTRIC WINDOWS. REMOTE CENTRAL LOCKING. PLEASE GOTO www.lowcostmotorcompany.co.uk TO VIEW OVER 120 CARS IN STOCK, SOME OF THE CHEAPEST ON AUTOTRADER. PREMIUM PLUS PACKAGE. 18" AMG ALLOYS. STUNNING OBSIDIAN BLACK WITH FULL BLACK LEATHER UPHOLSTERY WITH BLUE STITCHING. 19" DIAMOND CUT ALLOY WHEELS. SATELLITE NAVIGATION. FULL PANORAMIC GLASS ROOF. ELECTRIC HEATED SEATS. BLUETOOTH. PARKING ASSIST SELF PARKING. PLEASE GOTO www.lowcostmotorcompany.co.uk TO VIEW OVER 120 CARS IN STOCK, SOME OF THE CHEAPEST ON AUTOTRADER. FULL PANORAMIC GLASS ROOF. SAT NAV. 19" DIAMOND CUT ALLOY WHEELS. STUNNING OBSIDIAN BLACK METALLIC WITH FULL BLACK LEATHER UPHOLSTERY. ONLY ONE OWNER FROM NEW. VERY LOW MILEAGE. SATELLITE NAVIGATION. HEATED SETS. PARTIALLY ELECTRIC SEATS. CRUISE CONTROL. AIR CONDITIONING. 18" ALLOY WHEELS. ELECTRIC WINDOWS. REMOTE CENTRAL LOCKING WITH TWO KEYS. PLEASE GOTO www.lowcostmotorcompany.co.uk TO VIEW OVER 120 CARS IN STOCK, SOME OF THE CHEAPEST ON AUTOTRADER. SATELLITE NAVIGATION. CRUISE. AIR CON. With a superb range of used Mercedes-Benz cars for sale in Newport to choose from, you should have no trouble finding a model to suit your lifestyle and budget. 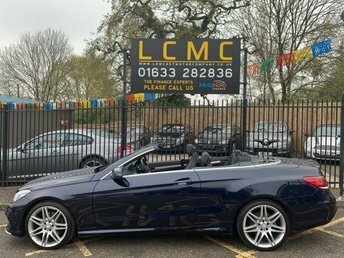 At Low Cost Motor Company we're committed to delivering excellent customer service and will always go further to ensure our customers drive away with a smile. If you're in the market for a sporty hatch like the Mercedes-Benz A-Class or require an elegant and supremely well-equipped executive model such as the C-Class Saloon, our team is here to help. Take the opportunity to browse our complete stock of pre-owned Mercedes-Benz cars here on the website and be sure to speak to a member of the team if you have any questions or wish to arrange a test drive.